What Is DD Form 2842? DD Form 2842, DoD Public Key Infrastructure (PKI) Subscriber Certificate Acceptance and Acknowledgement of Responsibilities is a form filed when applying for a personal identifier necessary for accessing most content on federal websites. Disclosure of any information pertaining to the DD Form 2842 is voluntarily, but no PKI private keys will be issued if the applicant fails to provide the requested information. The latest version of the form - sometimes incorrectly referred to as the DA Form 2842 - was released by the Department of Defense (DoD) in August 2009. An up-to-date DD Form 2842 fillable version is available for download and digital filing below or can be found through the Executive Services Directorate website. Most of the content on government websites can be accessed only if a user has a Federal/DoD Public Key Infrastructure (PKI), Personal Identity Verification (PIV), or a Common Access Card (CAC) installed in their browser. After the applicant successfully files the DD 2842, they will receive the certificates and keys needed to verify their digital signature and identity on these websites and gain access to certain systems. It's extremely important for subscribers to keep their access codes private. Writing them down - for instance - is prohibited. The key recovery base provides the opportunity to recover any lost data if necessary. If the codes are lost or misplaced, the subscriber must immediately contact their supervisor, security officer, Certification Authority (CA), Registration Authority (RA), Local Registration Authority (LRA), Trusted Agent (TA), or Verifying Official (VO). AUTHORITY: 5 U.S.C. 301, Departmental Regulation; 44 U.S.C. 3101.
identification of the subscriber who signs this form. ROUTINE USES: Information is used in the DOD PKI certificate registration process. keys on your token are government property and may be used for official purposes only. (LRA), Trusted Agent (TA), or Verifying Official (VO), immediately. issued by a DoD CA. Governing Law: DoD Public Key Certificates shall be governed by the laws of the United States of America. witnessed that person sign the form. Section 1 contains the privacy act statement and the authorization by the accepting authority. Some boxes may be filled automatically in the electronic form. Box A is for the last and first name, and the middle initial. All information is either written down or typed. Unique identification - like EDIPI or UID - is specified in Box B . If the federal government identification credential is inaccessible, the Subscriber may submit two non-federal government-issued identification cards; at least one of them should contain a photo. In this case, the descriptive names of both documents are inserted in Boxes F1 and G1, and their corresponding unique numbers are filled in Boxes F2 and G2. The Subscriber then signs and dates the form in Boxes H and I. The current date is given in the following format: YYYYMMMDD. Section 2 is filed by the Registration Official. Some boxes may be filled automatically in electronic forms, only empty lines need to be completed. Boxes A and B require the Official's name and organization respectively. Box C contains the Official's phone number with the area code and Box D specifies their email address. 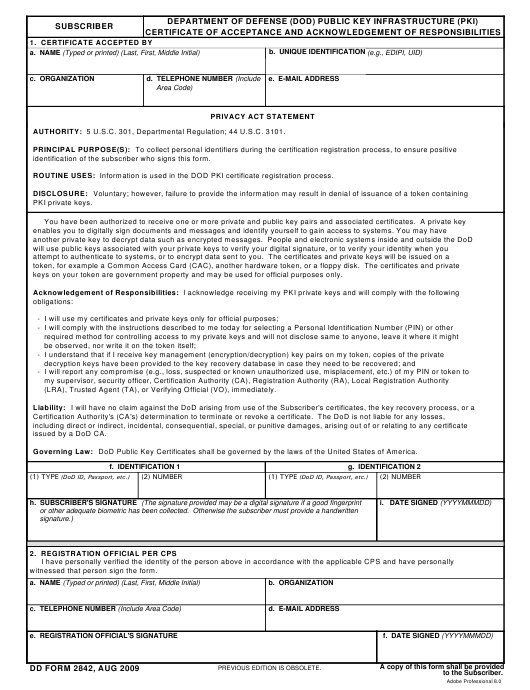 The Official gives their digital or handwritten signature in Box E and dates the form in Box E. The Subscriber must receive a copy of the DD 2846 from the Registration Official after the form is completely filled out and signed.